NOTE: For Baldy Mountain in the Lake Chelan-Sawtooth Wilderness, check out this post. 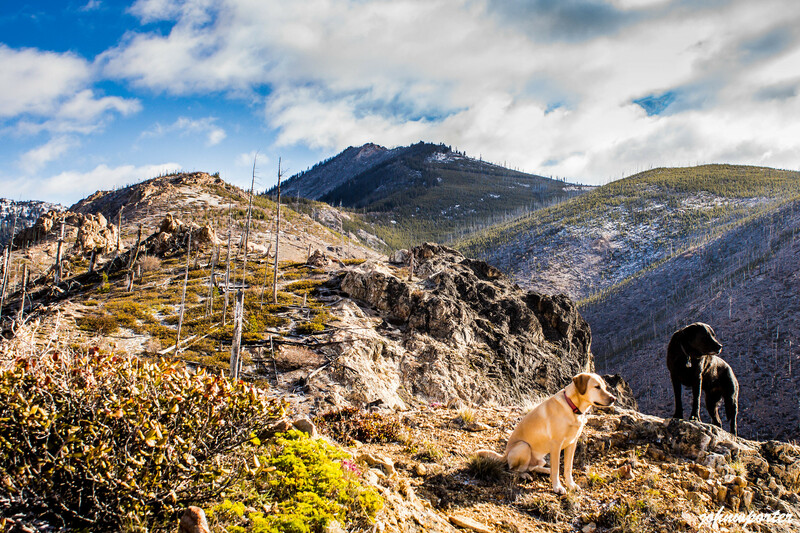 Pups and I continued our quest in the Chelan Mountains to dodge the less than ideal weather in the Cascades. Last weekend as all of us stood atop Stormy Mountain, I toyed with the idea of continuing on to Baldy Mountain. But given the snow conditions then and the long ridge traverse, I decided to make Baldy a separate trip instead. I drove to near the end of North Potato Creek Road (NF-310) and parked the vehicle at the foot of the ridge. The route closely followed the ridge and its entirety was mostly visible from the parking area. It was sunny and warm when we started hiking. What looked to be an innocent ridge traverse was soon taken over by down trees and sometimes brush. Around 4,600′ was our first encounter with s short section with low brush plus down trees. The brush thinned out past this section but soon more of it (and taller) appeared at 5,000′. We stayed just east of the ridge whenever necessary to bypass areas with most down trees and dense forest. West of the ridge was steeper and was nearly impossible to traverse given the number of down trees. The battle with brush and down trees continued to around 6,000′ and then the snow took over. From there we just needed to get around some boulders and rocks to reach the summit block. To get to the summit we went around to the north side of the summit block and relied on snow coverage to get us up the last 50 or so feet. The weather turned worse before we got to the summit, and we did not get another break in the clouds until half hour later. Very windy up top, but once the sun came out again it felt much better even with the wind continuing to blow. There were no views to the west because of the weather, so I didn’t get a chance to see all the big mountains in that general direction.